With the end of the HIV epidemic in sight, Dr. Valenti is looking to reignite HIV awareness and rally public support to fund the effort. All proceeds of book sales will be donated to Trillium Health’s Fund to End the HIV Epidemic by 2020. This fund is overseen by Trillium Health’s Innovation Institute, led by Dr. Valenti. Book proceeds support innovative outreach strategies to reach people at risk for HIV, make HIV testing more widely available, and overcome financial barriers to the once daily HIV prevention pill (PrEP). 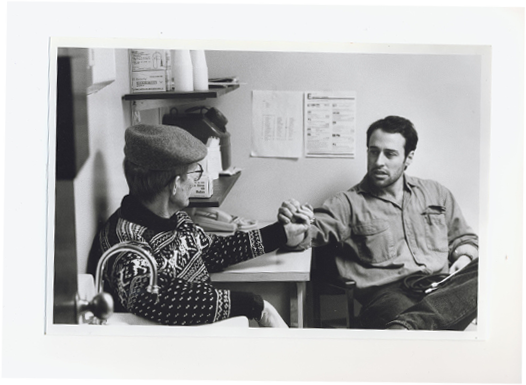 In January, the first U.S AIDS clinic is established in San Francisco. By the end of the year, more than 41,000 people had died of AIDS in the U.S. The Visual AIDS Artists Caucus launches the Red Ribbon Project to create a visual symbol to demonstrate compassion for people living with AIDS and their caregivers. The red ribbon becomes the international symbol of AIDS awareness. The World Health Organization (WHO) announces that HIV/AIDS has become the fourth biggest killer worldwide and the number one killer in Africa. WHO estimates that 33 million people are living with HIV, and that 14 million have died of AIDS. On April 30, President Clinton declares that HIV/AIDS is a threat to U.S. national security. Newly elected President Barack Obama calls for the development of the first National HIV/AIDS Strategy for the United States. The FDA approves the use of Truvada® for pre-exposure HIV prophylaxis (PrEP) in July. The United Nations AIDS Program (UNAIDS) reports that 17 million people were receiving HIV treatment as of December 2015, doubling the number of people in treatment compared with 2010.